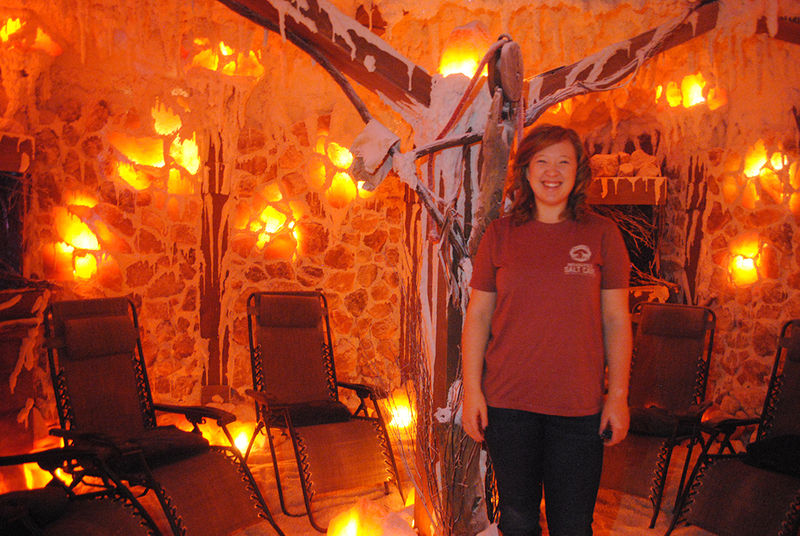 Stefanie Patterson offers many avenues at Indianapolis Salt Cave in Lawrence to foster overall holistic health, the most unique of which may be an indoor salt cave with 9 tons of Polish pink salt. Salt therapy dates to the 1800s when a Polish physician noticed workers coming out of Polish salt mines weren’t getting sick and their skin was very healthy. After research, the physician credited the salt in the mines. Two centuries later, some Polish salt mines are open to the public as healing centers. Patterson and her boyfriend, Danny Spiczenski, co-owners of the Indianapolis Salt Cave, imported the Polish pink salt to use in the flooring and along the walls. Water cascades In the Indianapolis Salt Cave truly create the cave effect. Without water, the cave would just be a salt room. Blankets are available for patrons. Up to 10 people can sit in the cave at a time. In addition to the salt features, a halogenerator allows patrons to experience halotherapy, which is breathing in dry salt aerosol. The halogenerator is recognized as a medical device in Europe, but Patterson said it is not yet recognized as such in the United States. Sessions in the salt cave are $35 for 45 minutes. Indianapolis Salt Cave also offers other therapies, such as an infrared sauna or the hand-and-foot detox. It has two infrared saunas, which are different than traditional dry saunas, which heat air. Infrared saunas reach a temperature of 116 to 120 degrees and cost $30 for 45 minutes. The hand-and-foot detox removes toxins from the body through the hands and feet. Patrons put their hands and feet on heated Himalayan salt rocks. The treatments is $30 for 45 minutes. Patterson said the hand-and-foot detox can be used for joint pain, arthritis, inflammation or carpal tunnel. Since opening nearly a year ago, Patterson said business has been robust, especially as patrons learn more about the benefits. Indy Salt Cave also sells salt lamps, bath salts, essential oils and related products. It is building a yurt outdoors to offer heated salt beds. The yurt should be complete by mid-summer. Stefanie Patterson and her boyfriend, Danny Spiczenski, opened the Indianapolis Salt Cave approximately one year ago. The relatively new Indy Salt Cave in Lawrence is in a building that was a firehouse from 1903 to 1995, when Fort Benjamin Harrison was decommissioned. Indy Salt Cave co-owner Stefanie Patterson said she and boyfriend co-owner Danny Spiczenski wanted to pay homage to the firehouse by hanging fire hoses from the ceiling and incorporating a fire station look in the Indy Salt Cave logo.